I have been photographing people in the area I live in for a few years. I find places have a certain feel to them, they can make you want to spend time there or not. I think it stems from an area's history, the landscape, the weather and from the people who are drawn to live there. Although often a hard wind blows and it can look quite bleak at times I fell in love with the atmosphere around Hallbankgate and decided to try and photograph that feeling and the people who are part of it. 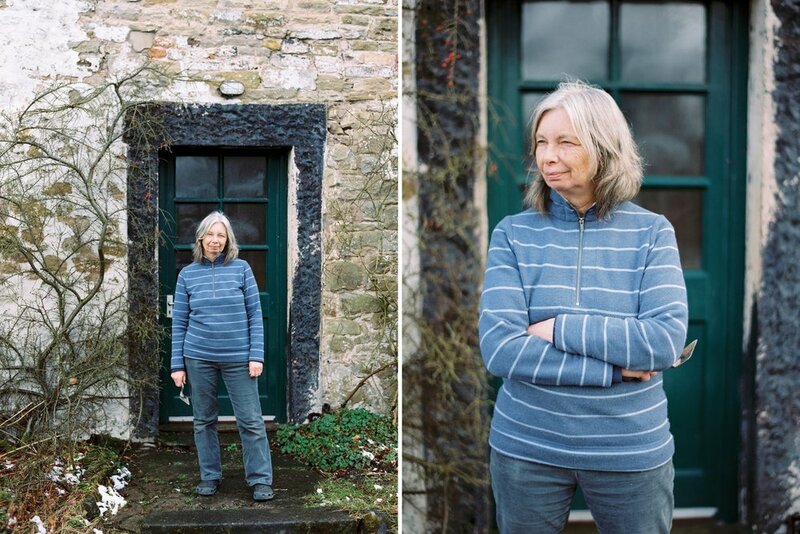 Janet lives next door to my mum in one of my favourite houses in the area, it has a welcoming and warming feel with an eclectic, artistic look, one that has evolved gradually with love over the years. Janet works with the land and as an artist her work features a lot about our natural landscape in the Pennines. This is Janet on her doorstep. If you live in the Hallbankgate, Brampton area and would like a doorstep photo I'd love to hear from you. There is no charge and you will receive a print and digital copy of your doorstep photograph. I hope to have an exhibition of these photos in the future.